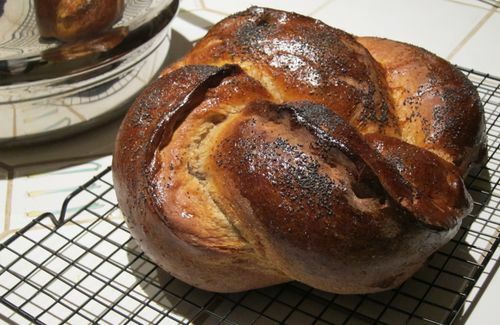 One of the treats of my life is Robin's Challah every Friday night at Shabat dinner. I smell it when I come into the house, and it comes out of the oven just before we light candles and sit down to eat. It's amazing! Last night she made a special challah, in honor of Purim this weekend, and I think in honor of being done with the surgery. 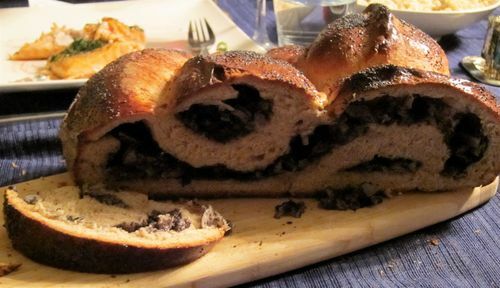 This challah is stuffed with onion and poppyseed. I behaved myself and only ate a couple of pieces, along with the rest of a very healthy, well-planned meal. But I think when I am 80 I will ask for a whole challah, just for me. I wish I could give you a piece. It's a dark, rainy, somewhat chilly morning and I don't have to be anywhere until 4 pm. I went back to bed for awhile, then read blogs and finally took a long, hot shower. Amazing what that does for all my aches. It doesn't seem to matter where the water hits me, usually on my back and the back of my neck, and all of the pains in my hip and legs go away. It's better than Tylenol, the only thing I'm supposed to take. I've really had a busy week. On Saturday, Ivetta and I went to the SPF Expo–Small Press Festival. It was very nice to see all those publishers, but the best thing for me was the venue: AIR: Artist Image Resource. They have open studio time; I could go and make silk screen prints if I can work up enough ambition. Something to keep in mind, anyway. 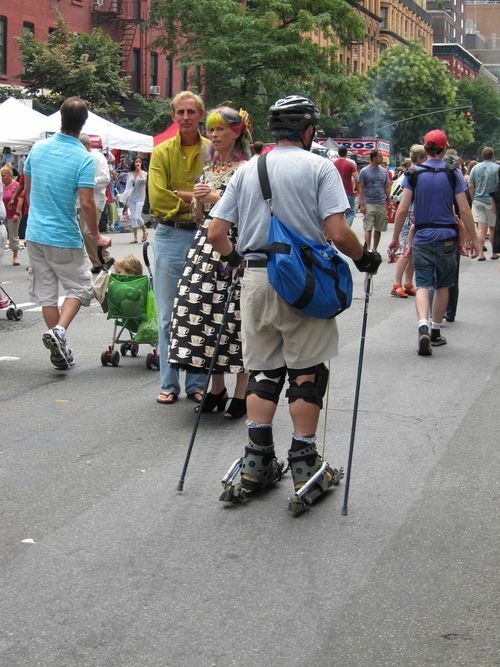 We went to another festival: Little Italy Days in Bloomfield. As with most large city ethnic neighborhoods, identity is anchored more in nostalgia than in reality. 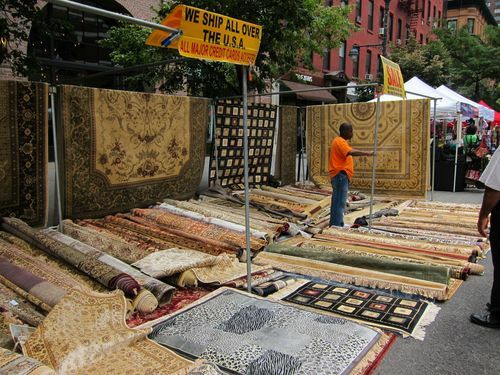 It was fun, a little like a New York street fair. Sunday night Robin served dinner in the sukkah–a Jewish holiday tradition. We had dinner in Dina's sukkah on Friday night. Miraculously it didn't rain either night–the usual sukkot event. Monday I went to my World War I class. That one is good. We are not fighting each battle, but rather, examining possible causes. Excellent presentation. Tuesday was Japanese art history, then an open house at the Intel lab at Carnegie Mellon. I find I can understand about half of what they try to tell me. Tuesday evening there was a lecture by Rev. Tom Johnson, Jr., who runs a school, the Neighborhood Academy, for children living in poverty. 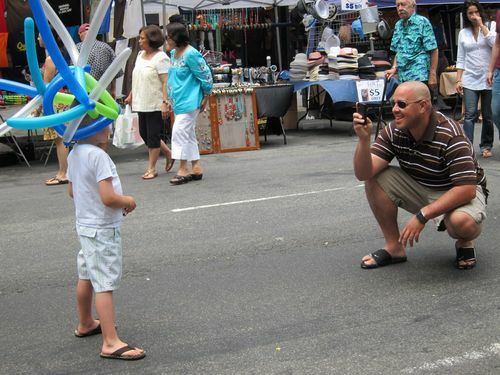 His goal, which he mostly has met, is to have 100% of his children graduate and go on to college. He explained his philosophy and his methods. I wish I had his talk written out. He's an amazing man. Yesterday was infectuous diseases, another great class. I can't say I have any special interest in diseases, or in World War 1, but a good teacher can really capture me. That's the best part of these OLLI (Osher LIfelong Learning Institute) classes. Yesterday was also my next to last cardio rehab session. Friday is the end, but there are ways to continue and I may do it. First, I'll see if I can get religious about going to the health club. In the evening I went on a walking tour of some of the art in East Liberty and in Mellon Park. I enjoyed the teacher and will be taking a class with her next month. It's been a beautiful weekend, the best one all summer–sunshine, cool breezes. I walked about a mile on Saturday, then two and a half on Sunday. This morning I went back to my health club to work out. Rehab was closed, so you can tell how dedicated I am. Unfortunately, my afib kicked in; I was wiped out all afternoon, never got out to another beautiful day. I feel better this evening after taking a long nap. I'm so inspired by the Japanese art class I printed out all the readings and I'm slogging my way through them. Most of it is way over my head. I vaguely remember something about Hegel from college, but never read any Foucault or the other two guys. The class is about space in Asian art. I understand a lot about space in art, but I"m not at all sure about the readings. I'm anxious to get to the class tomorrow, find out if anyone else understands this stuff. After making several flag books and a few single page books I'm back to work on my garden book. I think I've got about 250 pages already, mostly photos. I'm thinking about another trip to Japan, probably April or May. I don't know how this will work with my afib or all the blood tests, but I've got a little time to work on it. This week is Rosh Hashanah. I wish you all a happy, healthy, peaceful new year. Saturday I met up with Sybille again and went to the Jewish Museum to see the Curious George exhibit. It's amazing to know these people went through so many terrifying episodes to leave Europe during the Second World War, but still retained their imagination, creativity and the ability to appeal to children. Later in the afternoon I went out to New Jersey to visit with Robin's friends, Ron and Ilana. 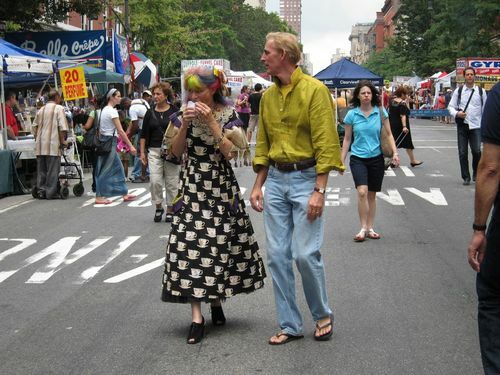 Two of the guests write art criticism for an online journal called Art Critical.com. They specialize in contemporary art, not exactly my cup of tea, but it was fun talking with them. I went from being Robin's mother to an artist in my own right. Very nice. 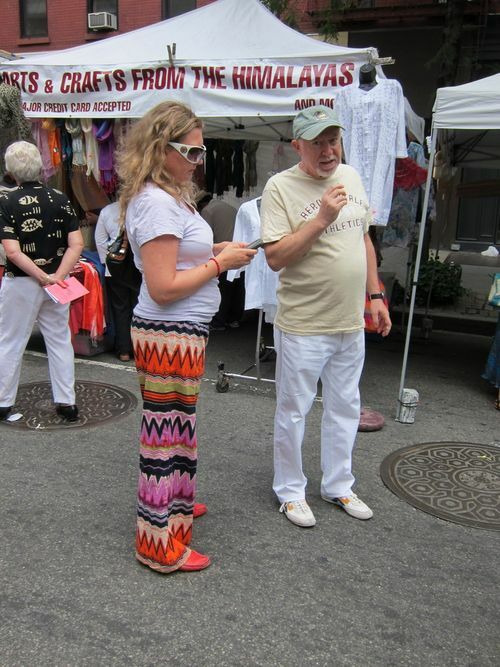 Sunday morning, for the first time in several years, I went to a street fair on Columbus Ave. 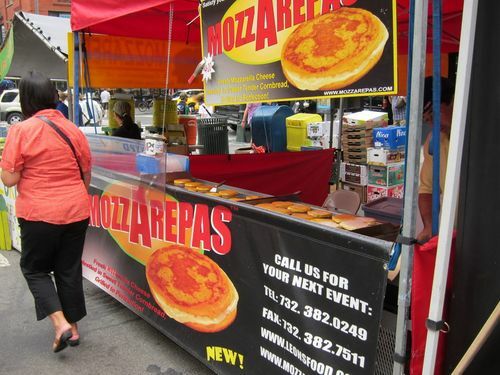 There were some vendors I had not seen before, and of course, my old favorite: Mozzarepa, another guilty pleasure. Love the lady's dress and hairdo. Renee came home on Sunday afternoon in terrible pain. She had fallen during the night and hurt her back. I helped her unpack then went out for dinner with another friend. Monday morning I met Mary over at MOMA to see the Matisse, then a nice visit over lunch. Finally, it was time for the appointment that brought me to New York: my contact lens optician. I will have new lenses when I get home and I have prescriptions for two different pairs of glasses, one pair to use without the lenses, one to go over the lenses. I went back to the apartment and brought dinner in for the two of us. Renee is feeling better today. I went looking for papers for bookmaking, again, and actually found something I liked and could afford. Lunch was at an Indian buffet on 56th St. where I sat in the window and looked at this strange old building that fronts on 57th. 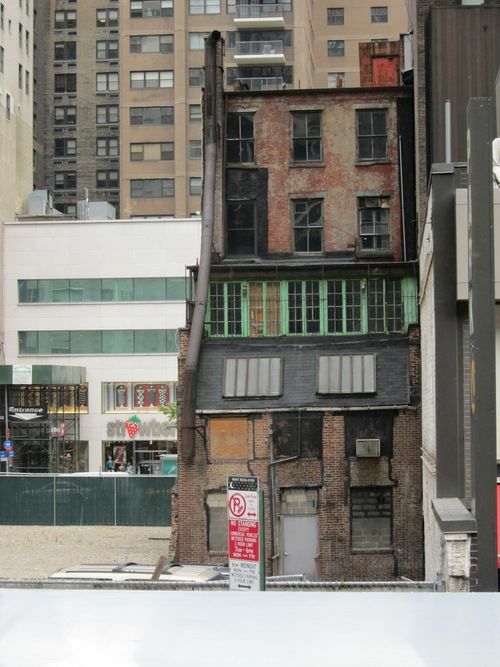 I'm always fascinated by these seemingly forgotten bits of real estate in very high-priced areas. After much walking I limped back to the apartment; a satisfying day. I’m sitting in a lovely hotel room just outside of Chicago–a rare experience for me–and enjoying doing nothing. Robin and Steve arrived earlier. I gave them the car and they went shopping. Tonight is Jerry’s wedding; I’m resting, regrouping and enjoying the free wi-fi with two days to tell about. I got a parking space at 9:30 Wednesday evening; undoubtedly the luckiest day of all. First a long lunch with my cousin Phyllis, shopping with no purchases to show for it, dinner with Karen and Kathryn. All told a satisfying day. Found out the North Shore Hotel in Evanston is still a retirement facility. If I ever decide to come back here, that’s the place. 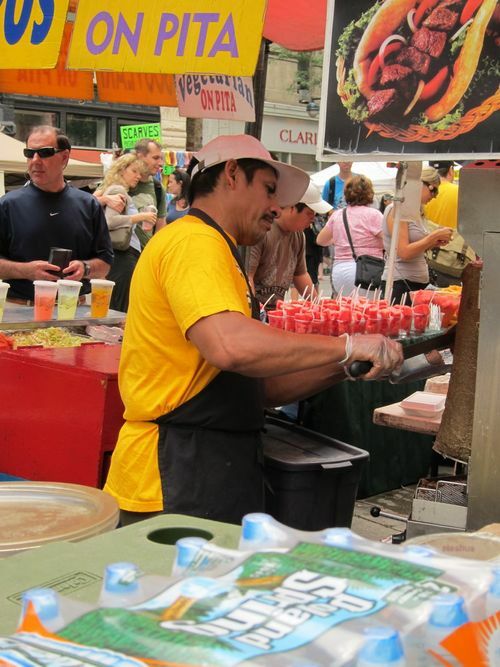 Everything in downtown Evanston and much of Northwestern is accessible on foot and there is train service to downtown Chicago. Thursday, Betty and I went to Skokie to the Illinois Holocaust Museum. They told us it would take one or two hours to go through; we were there four or five hours. It’s a heart wrenching experience. Original films and oral histories are used to tell the stories of the people whose lives were so drastically affected by Hitler and his war against the Jews. I am always amazed at how pervasive anti-semitism is, and how easily it is blamed for anything someone doesn't like. 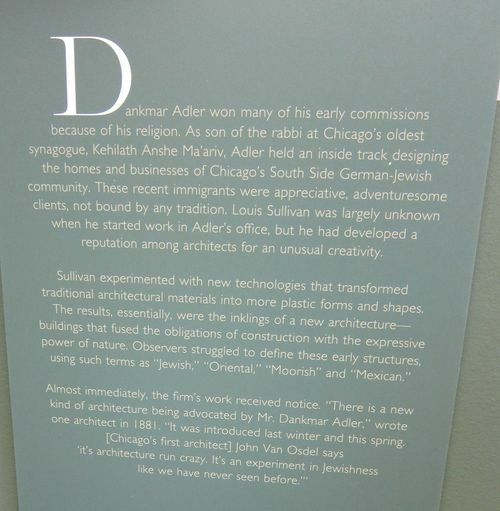 Louis Sullivan, not a Jew but with a Jewish partner, whose work was too "different" for the establishment and establishment architects, was accused of creating Jewishness (whatever that means), according to this statement in the exhibit I saw on Tuesday. (Chicago's first architect) John van Osdel says "it's architecture run crazy. 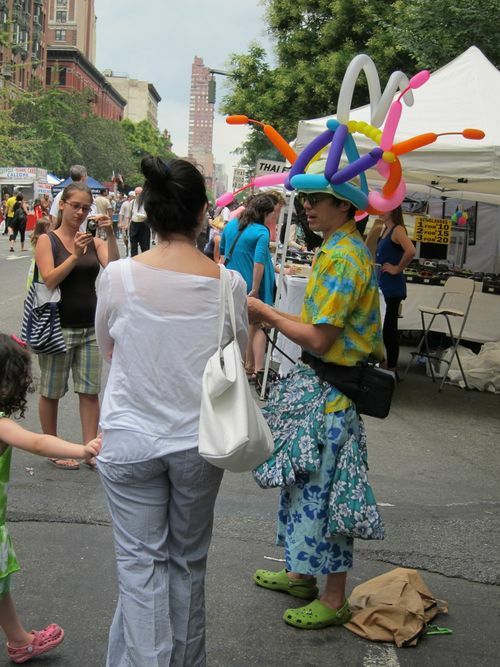 It's an experiment in Jewishness like we have never seen before."